June’s Girl Scout troop went on a camping trip the last weekend in April. Well, they’ve been going in shifts, but June went that weekend, and Beth went along as a chaperone. While they were gone Noah and I passed a quiet weekend. He made some progress catching up on a backlog of overdue homework and I cleaned the kitchen and bathroom, worked in the garden, went swimming and to the library. Beth and June returned around lunchtime on Sunday. When I asked June how the trip went she gave me a thumbs up but said nothing. When I jokingly asked if she’d lost the power of speech, she nodded. She’d woken that morning with laryngitis. As a result, I didn’t learn as much about the camping trip as I might have right away, but Beth did her best to fill me in, telling me about the archery and hollow tree so big twelve girls could stand inside and the Maker’s Fair where despite the presence of 3D printer and 3D pens, most of the girls just wanted to make things out of cardboard boxes. Beth also said they cooked most of their meals over fires, so I thought maybe June’s throat had gotten irritated by all the smoke. 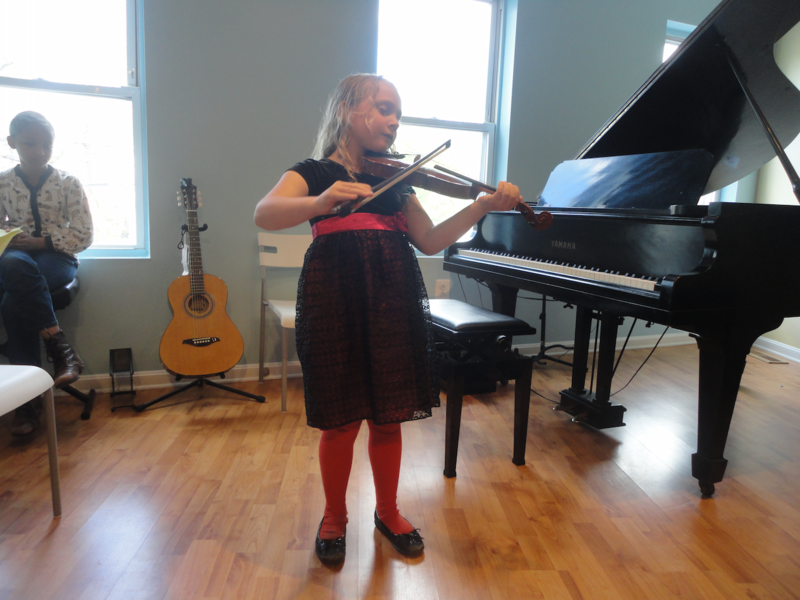 June had a violin recital that afternoon. As she felt fine other than her inability to speak, we went. The recital had been divided into three performances because there are too many students to fit all at once in the school’s largest room. There were ten students playing at the 5:30 performance. Eight of them played piano, there was one guitarist, and June was the sole violinist. I was privately amused that the boy playing the guitar was named Dylan. June played seventh. They put the more advanced students at the end so she’s been pleased to see her name appearing later and later in the program with each new recital. It may have also helped that the students at this particular recital seemed to skew a bit young. The oldest performer was probably eleven or twelve and usually there’s a teenager or two. June composed the piece the played herself. It’s called “Owl in Flight” and it has a haunting, slightly mournful sound, especially at the beginning. When she was first writing it she said she imagined it could be played at a funeral, and she considered my suggestion of “Memory” as a title (or maybe she was just being polite). She played well and got a lot of applause. Here’s a video. After the students had finished, a guitar teacher played a couple songs, including Dylan’s “I Shall Be Released,” and Simon and Garfunkel’s “Overs.” He played harmonica and sang as well. I thought the Simon and Garfunkel song was a bit of an odd choice to use as inspiration for a group of mostly elementary school-aged kids. It doesn’t contain anything wildly inappropriate, it’s just unlikely they’d be able to relate to melancholy song about the break up of a long-term relationship. After the recital we had dinner at Busboys and Poets, which opened in February. It’s a bookstore with a restaurant wrapped around it, if you can visualize that. Anyway, the food is very good and we are very excited to have a real bookstore in Takoma again. The selection is small, but you can special order any book they have at Politics and Prose, and pick it up a day or two later, so it’s almost like having a big bookstore a mile from our house. Beth got vegan coq au vin, and I got a grilled Brie and vegetable panini and the kids got pizza. It was an inconvenient school week for June not to be able to talk because she had two oral presentations. Her English class was having a publishing party to read the storybooks they’d written to each other and parents and in her Spanish class they were presenting their research projects on contagious diseases. June and Zoë have been collaborating on an informative poster, speech, and skit about pinworm. (The poster has a border of squiggly worms drawn in marker, which I thought was a nice touch. I’d include a picture, but it’s at Zoë’s house.) I wrote a note, asking her teacher if they could go last in hopes that June’s voice would return in time and the teacher agreed. The publishing party was Wednesday. I was hoping June’s voice would be back by then but it wasn’t, so the teacher read her story for her. It wasn’t quite as festive as June’s second grade teacher’s publishing parties, but Ms. K was admittedly quite a hard act to follow. It was nice to hear June’s story, a tale of friendship drama, read aloud. I’d like to say it was nice to hear her classmates’ work, too, but most of them read so quietly I was hard pressed to figure out what to write on my comment cards. I strained to hear and managed to find something complimentary to say for most of the kids in her group and when I couldn’t, I wrote about the illustrations. Their storybooks were printed and bound and they came out looking very nice. After the kids had finished reading, Ms. P served them cookies and carrots and the adults left. Only a few parents had come (it was pretty short notice) and June seemed pleased I’d was there. As for the pinworm presentation, the class has not yet finished with these, so there’s a chance June may still get the opportunity to act the part of the girl who wears her gardening gloves and doesn’t get pinworm in front of her class. I hope so. It’s been a week now since June lost her voice and now she has a barking cough to go with it so Beth’s going to take her to the doctor this week. I miss hearing her voice. At Noah’s birthday dinner tonight (more about that in a future post), I told her so, and Beth and even Noah chimed in they missed it, too. “I’ve been missing it since I lost it,” June whispered. She took a little notebook to class with her all week so she could write to make herself understood and at home she’s mostly been whispering, so we still know what’s on her mind. And next Tuesday the whole third grade will be performing a recorder concert before a PTA meeting, so I know she will continue to make herself heard. This entry was posted in Extracurricular Activities, Medical Issues by Steph. Bookmark the permalink.